Ras protein with a non-hydrolyzable analogue of GTP. Cells are constantly sending messages, discussing nutrient levels and growth rates with other cells, and also managing the internal needs of the cell. These messages need to be clear and strong, so that they can be heard over the busy bustle inside the crowded cytoplasm. One way to strengthen signals is to link them to a process that is chemically irreversible, like the cleavage of ATP or GTP. The Ras protein, shown here from PDB entry 5p21 , uses this approach. It is normally in the "off" state, with GDP bound in the site. To turn it "on," the GDP is swapped for GTP. Then, after the signal is delivered, the GTP is cleaved to GDP and phosphate, turning the protein firmly off. It is particularly important that Ras has an unambiguous off state, because it is intimately involved in the control of cell growth. Oncogenes are genes that are closely linked to cancer, and the gene that encodes Ras was among the first to be discovered. Mutation of an oncogene changes the function of the encoded protein, creating the malignant properties that are needed for cancer to grow and spread. For instance, some oncogenes encode proteins involved in programmed cell death, such as p53 tumor suppressor, and the oncogenic mutation allows the cancer cell to evade our powerful protections against abnormal growth. Ras is involved in the signals passed between cells that control the amount of growth that is allowed at any time. 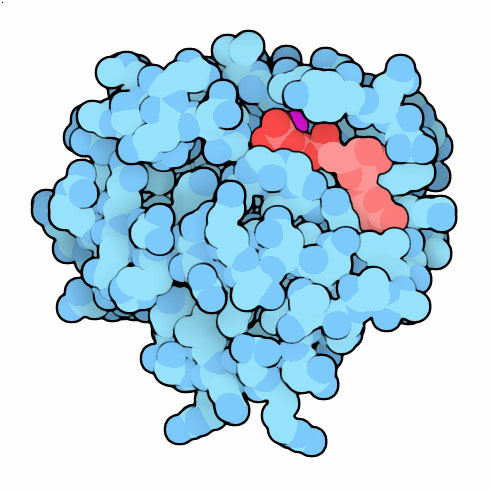 Cancer-causing mutation of Ras creates a form of the protein that is always on. This is a disaster, because the mutated Ras continually tells the cancer cells that it is okay to multiply, without the normal limits that control cell growth. Proteins involved in ras signalling, including lipid kinase PI3Kgamma (left), a GTPase-activating protein p120GAP (top right), and guanine nucleotide exchange factor Sos-1 (bottom right). Ras is at the middle of a complex signaling network that delivers messages about growth, and is assisted by many different proteins. GEF proteins (guanine nucleotide exchange factors), such as Sos-1 shown here (PDB entry 1bkd ), turn the Ras switch on. They wrench open the binding site, allowing GDP to exit. Once GTP has bound in the empty site, the on state interacts with effectors like PI3Kγ (PDB entry 1he8 ), a lipid kinase that phosphorylates lipids in the signaling network. Ras will then slowly break the GTP, but the process is accelerated by GAPs (GTPase-activating proteins), such as p120GAP shown here (PDB entry 1wq1 ). Many structures for Ras have been solved, showing the different conformational states in the signaling cycle. The two shown here capture Ras with GTP and GDP, in the on and off states (PDB entries 5p21 and 4q21 ). Comparison of these structures revealed that two loops (in green) near the nucleotide change conformation. This is the signal that is recognized by the effector proteins that transmit the signal. Structures have also revealed the importance of glutamine 61, which positions a water molecule to perform the cleavage reaction. This glutamine is often mutated in cancer cells, so the GTP is never cleaved and the protein is always turned on. To see several other structures that show the action of this amino acid, click on the image for an interactive Jmol. Structures for several mutants of Ras have been solved, including Ras with mutations of glutamine 61. You can use the Structure Comparison tool to compare these to the normal form of the protein. Many structures of Ras have been solved with modified forms of GTP, with nitrogen or carbon atoms connecting the phosphates. Why is this necessary? I. R. Vetter and A. Wittinghofer (2001) The guanine nucleotide-binding switch in three dimensions. Science 294, 1299-1304.